All Saints Terrington is a grade one listed Medieval Church. The present buildings has its origins in the 11th Century evidenced by herringbone stone work characteristic of that time, in the South Aisle wall and also a lancet window. This window has a lintel made of recycled 8/9th Century gravemarker suggesting that there was an earlier church on the site. The north Aisle was built out in the 12C when two unequal arches were formed. In the 14C the South Aisle wall was broken through to create a chantry chapel for Sir Brian Stapleton of Wiganthorpe. The windows in the outer wall of the North Aisle date from the 15C. At around this time the Clerestory was added to the South Aisle and the West Tower was created. The Chancel arch probably dates from the 14C like the Chantry Chapel. In the 15C the choir was built and the North Aisle extended to form a North Chapel. The Church was significantly restored in 1868 by the Rector Samuel Wimbush. The work added the South Aisle and Porch on the site of the earlier chantry chapel demolished in the Reformation. The gallery and pews were removed and replaced including the creation of a reading desk and pulpit The 15C font was set in its present position near the South door. The North Chapel was divided to from the vestry, the organ installed, the East Window renewed and stain glass inserted and the Reredos erected. The North Aisle work work involved raising the floor and adding a wooden floor. A brass plaque in the floor records the names of those buried here the earliest dating from 1514. The whole roof and timbers were renewed. The Church interior includes a number of interesting features including a medieval piscina in the south wall of the chancel and a restores ambulatory in the south aisle wall. The church contains a number of monuments to local people the finest of which is dated 1733 for Lewis Elstob but is now concealed from the Nave by the Tower screen. There is raised slab in the floor by the north side of the chancel arch which appears to be part of a grave inscription probably in Norman/French and recycled. A First World War Roll of Honour is opposite the South door on the Tower wall. The stain glass is all Victorian onwards. The most notable is the South Window is a good example of early 20th century Arts and Crafts glass painting by Morris & Co after the design of three main figures by Sir Edward Burns – Jones. Other artefacts in the church include a Sanctus Bell dug up in 1878 from 7ft below the Bell Tower were it had probably been hidden after the Puritan purges. It has a three fold loop for hanging. On it are four stamps- the letter C or S repeated three times and the reed and sponge of the passion cross wise behind a cross. There is a Victorian wooden collecting box inscribed with the name of the church warden. The Victorian brass lecturn has a finely carved eagles head. The original 17th Century altar plate made in York still survives. The oldest of the three bells in the Tower, the tenor, dates from 1450 and is inscribed in Latin “ pray for the soul of Robert the Prior” – probably Robert Cave who was Prior at Marton Priory and whose priory held lands in Terrington. External to the Church and high in the Tower South Wall is a sundial/clock dated 1767 put up by churchwardens Thomas Marton and Robert Campleman. It is inscribed “Robert Campleman sculpsit 1767”. The Parish Registers refer to a contract for the maintenance of a clock in 1621. The present clock dates from 1876 and was refurbished in 1992. On the north aisle external wall there is a medieval mass dial probably recycled from the South side of the church. The graveyard surrounding the church was closed in 1905. Its most significant grave is of Robert Spruce 1817-1893. He was born at Ganthorpe and was a notable botanist. Amongst his many achievements was collecting seeds to grow plants and make quinine which help thousands of people suffering from malaria. There is Second World War Memorial Celtic cross opposite the South Door in the graveyard. 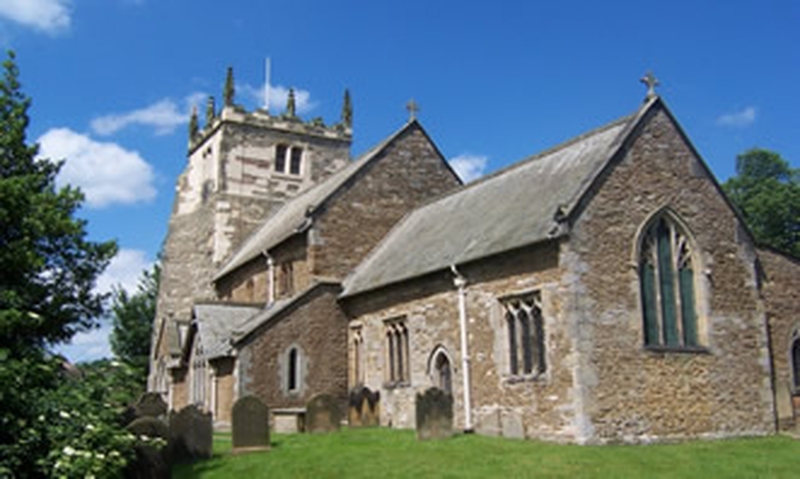 The church is on the northern edge of the village of Terrington and looks out over the rolling Howardian Hills to the North Yorkshire Moors beyond. The view is obscured now by conifer trees on the edge of the churchyard. On the South and North and East of the church is the old Rectory and its grounds built by Rev Charles Hall in 1822 and now Terrington Hall Preparatory School. The church is open every day during daylight hours to visitors. Not all the artefacts are on public display at present but we can arrange guided tours for groups to include them at a small fee. Our Local History Group has information on past residents of Terrington. Please use the email on the contact page for more information.